Onsen Farm’s growing season begins when most farms are buttoning up for the winter – in November. 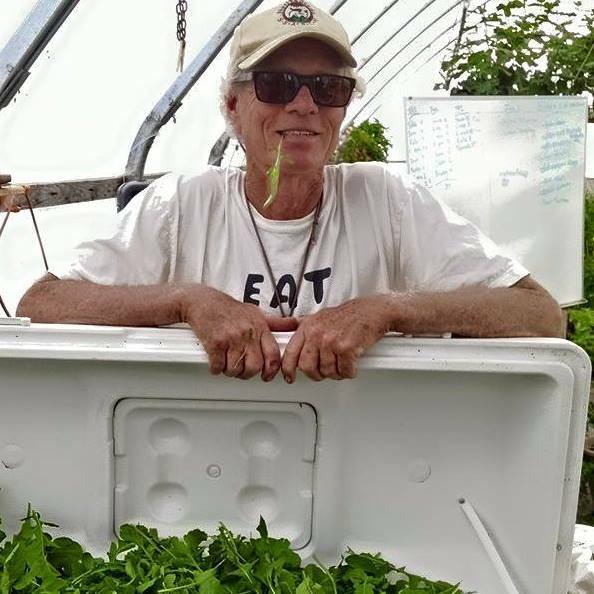 Leveraging the “miracle” of 125-degree geothermal spring water in greenhouses on the Hagerman Valley’s Miracle Mile, James Reed, with his wife Leslee, has developed not only a winter-producing farm, but a community that demonstrates the systemic potential of agriculture. Onsen’s mission is “to create a permaculture-based way of living using sustainable practices in raising healthy food for vibrant people.” In their greenhouses, the Reeds grow directly into the soil, with a focus on building a robust and dynamic ecosystem. They rely on labor from people who want to come, enjoy free food, and soak in the healing hot springs in exchange for education. The former Hailey furniture maker, a founder of Idaho’s Bounty, turned to farming relatively late in life – after his children were all grown. But he’s proving that you’re never too old to start. Onsen Farm’s products are available through Idaho’s Bounty Co-op, Nourishme in Ketchum, The Boise Co-op and several restaurants in the Wood River Valley and Boise. As co-founder of Idaho’s Bounty, I realized early on that if we were going to launch a viable local food distribution system, we would need local food year round to keep members engaged and fuel in the trucks. Onsen Farm is blessed with 125-degree geothermal water, perfect for heating greenhouses. I had never farmed before but with my son Ian, and his friend Evan Sofro, we jumped in and put up our first greenhouse in 2007 and started growing. We now have five greenhouses and some fun intern accommodations. My favorite food to grow is leafy greens, blending them into amazingly fresh salad mixes. They are beautiful and nutrient dense and last so long. Calling myself a farmer is a very recent experience for me and it feels good. I am honored to be a farmer along with my farmer friends who I respect so much. To be a part of this tribe is very exciting. Farmers always work together and help each other. I love sharing what we do with our interns and guests. Working with plants growing in soil that we have built is a walk into endless mystery and challenge. No real farmer will ever say that he knows it all. Working with mother nature along with plant and soil life is a very exciting journey. Perfectly healthy soil is the end goal, which in turn produces vibrant plants (food), which becomes tasty medicine for the people. Being intimately involved in this journey and sharing it with others is what I love most about farming. Finding enough hours in the day to do everything. It’s not just about having time to grow the crops. There are a lot of things to build, repair, upgrade, clean up, organize and make beautiful. And then there’s finding the time for several hot springs baths each day. What do you wish people better understood about farming? Farming is an honorable and sacred occupation. So many people have left the family farm over the past two generations. Farmers are rare in these times, especially farmers who are farming in an environmentally sustainable way, with love for the land. We need fields of farmers. People need to realize how important it is to support local farms and farmers. Otherwise, these farms offering an alternative to the industrial food system will go away. What’s your advice for fledgling farmers? Dream big, start small, go learn from other farmers and never quit being a student. Stay out of debt. Learn all you can and work hard. In my opinion, farming done well gives back a wonderful and blessed lifestyle.